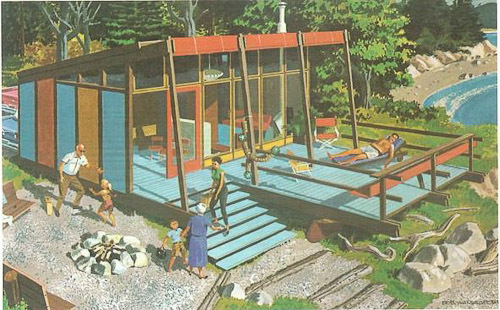 Snaps to Sarah for spotting this 1960s catalog of vacation houses promoting the use of Douglas Fir Plywood. It includes some pretty snappy — and in their way, hilarious — designs. 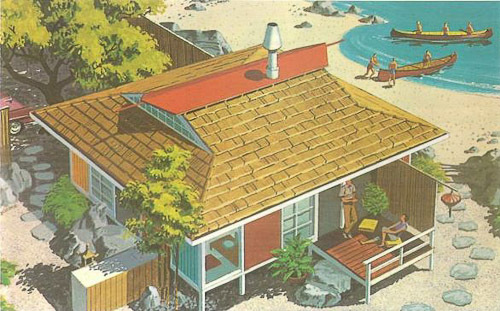 “Novelty” vacation home ideas — my favorite is the Japanese tea house… but the Homarina, set right over the water… Home + Marina, get it?… is pretty great, too. Did anyone really build these, I wonder? The two images above are both from the “tea house”. The interior is so modern, all George Nelson-like. Inside, almost all these designs have Malm style fireplaces. 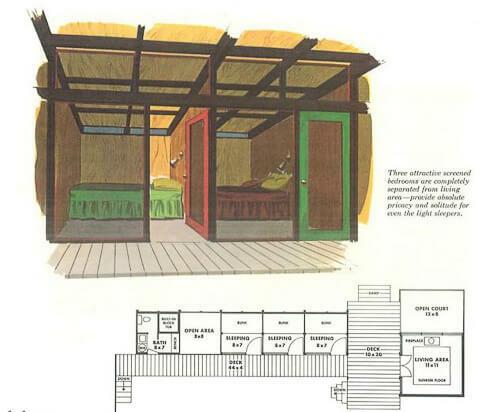 The two photos above: The awesome “Ranch Rambler” — with its row of small sleeping nooks all in a row, separated from the main living area by a deck. 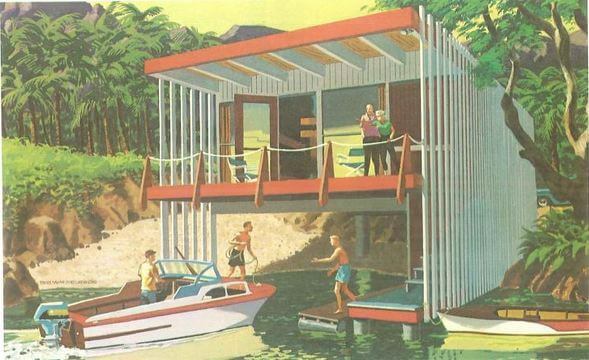 What a great concept — when you are on vacation at the lake, you don’t need big bedrooms… yet, it’s nice for everyone to have their own space. Alas, where is the kitchen? 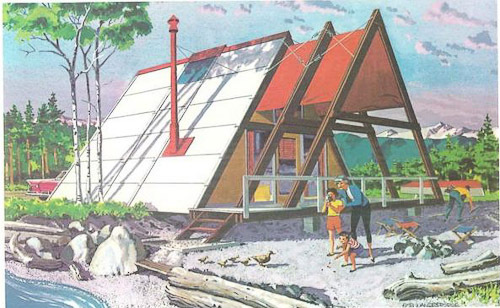 You get your A-Frame cottages, of course. Did anyone ever have one of these? They seem pretty practical to me. 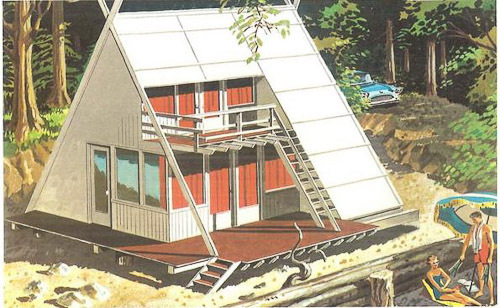 This A-frame cabin is pretty snappy, too. 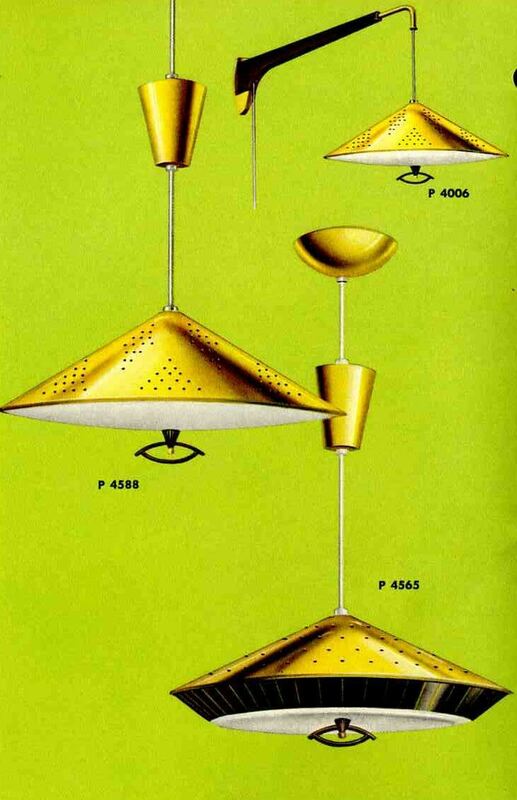 So clever, those designers in the 1950s and 1960s. 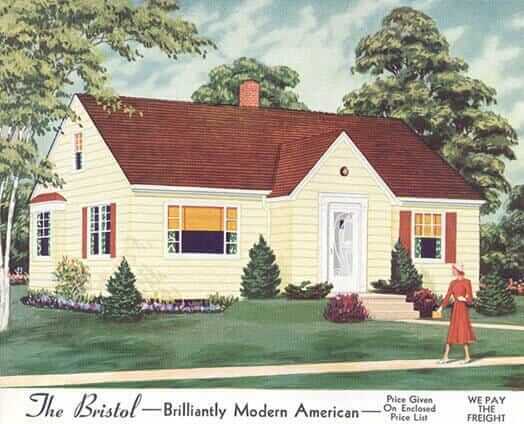 There is so much media these days about stylish “modern” small houses — the designs have been here for us all along! 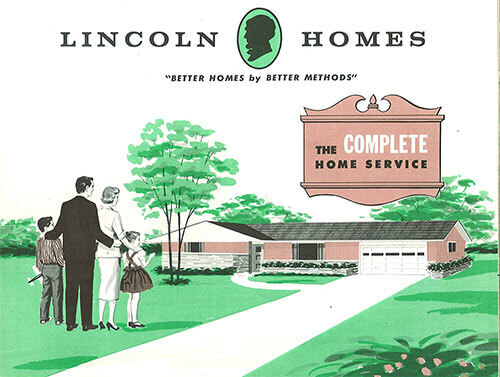 See all 18 designs in the 1960 brochure at archive.org. Thanks, Sarah! 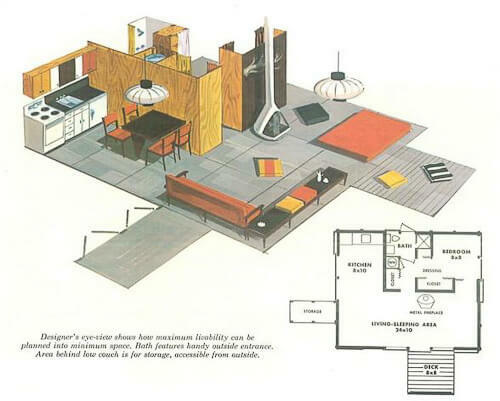 Many of those great designs were by Walter Widmeyer, the staff architect for DFPA during the 1950s. For some great biographical info see: http://www.docomomo-wewa.org/architects_detail.php?id=61. OMG I would love to live in some of these houses, year round would be just fine in the right location. 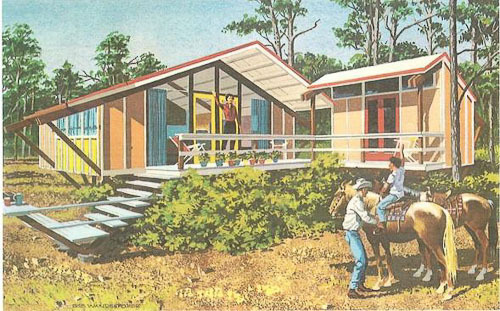 The Ranch Rambler could even be stylized like a little hotel for your guests for fun. 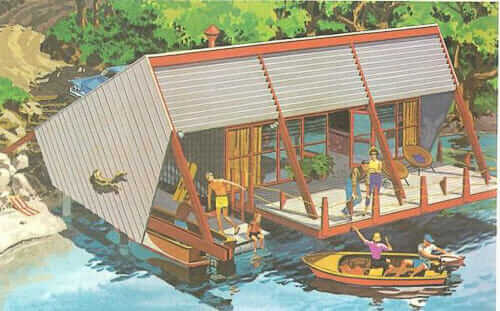 The Tea House would be a seaside showplace with a big jacuzzi built into that little deck off the living area. The Homarina could get very posh with an indoor/outdoor dining space and an outdoor kitchen built in under the awning. 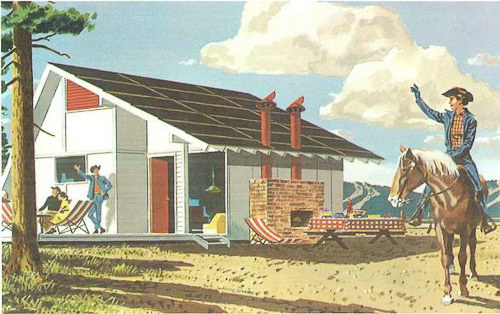 Yes, I’m quite taken with the Ranch Rambler for a lakeside cottage. 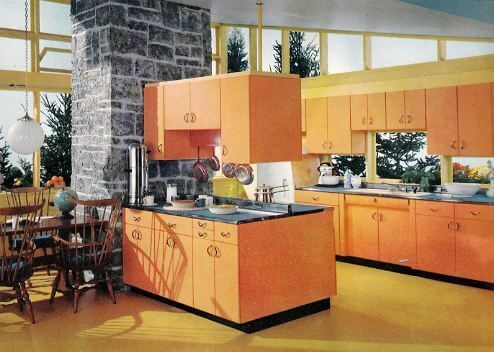 The kitchen? Oh, that’d be the stainless steel “cleaning station” by the fire pit, where you clean and fillet the day’s catch of Mahi or panfish or silver carp. Might keep a few MREs in the storage area, just in case fishing gets a bit slow. 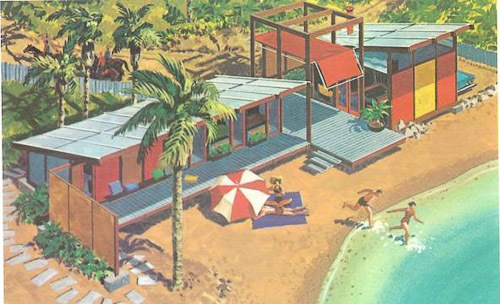 You can still find this houses in Fire Island, NY, is plenty of them in mint condition.